On a sunny September afternoon I had the opportunity to go for an ultralight flight with Andreas Ruttkiewicz of Airspeed High Ultralight Flight School, located at the Courtenay Airpark. The ease of an ultralight flight is impressive—it takes surprisingly little time and effort to prepare the plane and ourselves for our flight. And once on the runway I was a little surprised when our wheels left the ground. Once aloft, we gained altitude quickly and soon we were flying high above the water, over Goose Spit and Little Mexico and then heading south with Denman Island to our left and the Beaufort Range to our right. As we circled westward to fly above Cumberland and Comox Lake I was able to see familiar sights from a vantage point that was both mesmerizing and breathtaking. Before turning back to the airpark Ruttkiewicz allowed me to take the controls. The plane was so much fun to fly, so forgiving, capable and maneuverable. It was an energizing and invigorating experience I was sorry to see end. As we touched down, I realized I was entranced with ultralight flight and I began to work out how I could learn to fly one on my own. Ruttkiewicz and I flew above the Comox Valley in a 2006 Challenger II advanced ultralight manufactured by Quad City Aircraft Corporation of Moline, Illinois. Actually, the kit was manufactured by Quad City, but the airplane itself was assembled by Ruttkiewicz. It took Ruttkiewicz about 400 hours—or a year and a half—to build his ultralight, but he still recommends the experience to anyone. Ruttkiewicz’ Challenger is even equipped with a ballistic recovery system that can deploy a parachute for the entire aircraft to be lowered to the ground safely. Of course, one must learn to fly the airplane, and that’s where Airspeed High comes in. 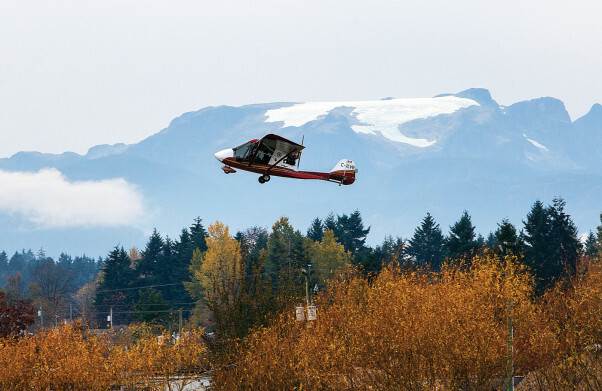 Over the years, Ruttkiewicz has been able to introduce many people to ultralight flight, as he’s ran an ultralight flight school since 2009—first in Victoria and now in the Comox Valley. Currently, Ruttkiewicz has five students in his Courtenay Airpark location. The average age of his students is 50, but one student is only 16. “It costs approximately $3,500 to $5,000 to get an ultralight pilot’s licence, but compared to a private pilot’s license—which is around 17 grand—it’s quite a bit less,” Ruttkiewicz says. Students must attend a 30-hour ground school component and most need 20 to 25 hours in the airplane to become proficient pilots. “Besides being a lot of fun, for some students, this is the first step they take toward a career in the aviation industry,” adds Ruttkiewicz. Though Ruttkiewicz dreamed of flying when he was very young he had to wait until he was 14 to finally have his first flight. That flight was in an ultralight and from there his love affair with flying was unstoppable. Eventually, Ruttkiewicz entered the Canadian Airforce where he flew T33s and F18s. The military offered Ruttkiewicz a desk job, but he knew he wouldn’t be happy doing that. He left the military to pursue a degree in computer sciences and he also met his future wife, Michele. Eventually, the couple bought a sailboat and spent two years cruising the Sea of Cortez, which he remembers as the best two years of his life. But flying was still in his blood, and with time Ruttkiewicz realized he needed to become a pilot again. Many people are surprised to learn Ruttkiewicz has physical challenges—at first glance they are barely noticeable. People are even more surprised when they learn that it’s possible to fly an airplane with such physical limitations. Ruttkiewicz had a goal—he wanted to make aviation his career again. “My goal was to build the plane, learn to fly it, get my instructor’s rating and start a flight school,” he says. “Three years later I had my first student. In addition to Ruttkiewicz’s experience as a military fighter jet pilot he is also a Transport Canada Authorized Person (AP), a Transport Canada Pilot Examiner (PE) and an Industry Canada Radio License Examiner. As a result, he brings something unique to his flight school. 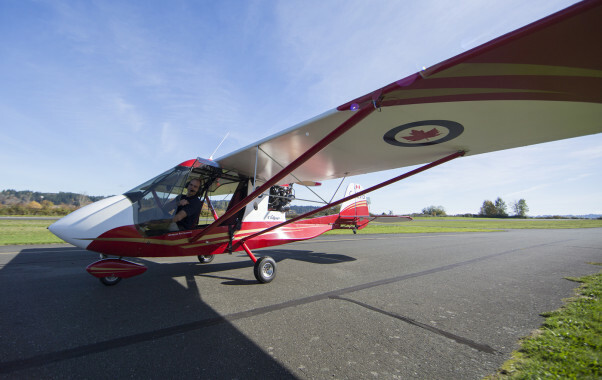 Aside from the flight school, Airspeed High also offers scenic and discovery flights for those who are interested in learning to fly or who just want to spend an afternoon seeing the Comox Valley from a new vantage point. In fact, many Valley residents have realized that an ultralight flight is a unique gift for an adventurous friend or relative. 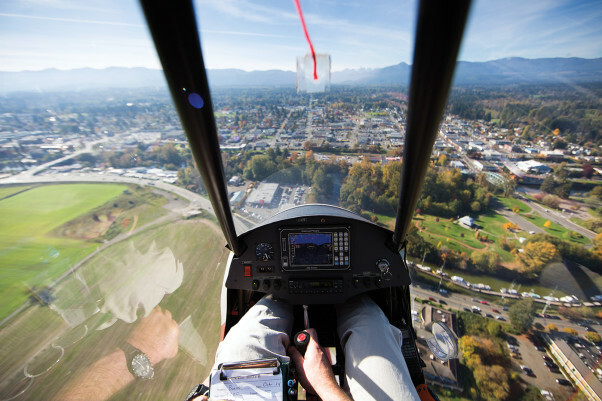 “The scenic flights have become very popular,” Ruttkiewicz says. “It’s a way to show people a unique view of our Valley and it’s a great opportunity to show them what ultralight flight is really like.” A basic scenic flight is an hour long and costs $120. The longer glacier flight is $200 but lasts for 90 minutes. Though Ruttkiewicz has seen some challenges during his life, it is a testament to his tenacity of spirit that he has not let these challenges keep him from his lifelong passion.